The Citra Saison is BBNo.’s modern interpretation of a Belgian farmhouse-style classic. A light, crisp body, fresh fruit/spice flavour and a mild bitterness make this a very refreshing, drinkable beer. UPDATED: JAN 18, 2019 Murky gold, thin head. Aroma peaches, hints of apple. Taste is spritzy, slightly sour. Refreshing and dry. UPDATED: OCT 31, 2018 From backlog. Taster at Haand Festival. Yellow with white head. Malts, hops, yeast, spices and Citrus. UPDATED: AUG 17, 2018 Bottle smuggled back to Australia from London. Quite a dry Saison with delicious barnyard funky notes. Straw blond with thin head. Aroma has some sweet apple and peachy notes. Flavour is also a bit sweet but also a bit soapy. Coriander? Fad. Gulorange let diset uden skum. Duften er let sur saison. Mundfylden er lidt tynd. Masse af bitterhed. Rigtig fin øl. 330ml bottle. Slightly hazy golden with a big frothy head. Very citrusy aroma, lemon and orange, light funk and spice. Taste of lemon, orange, spicy yeast, slightly floral, malts. Medium body, soft carbonation. Enjoyable saison, Citra hops work really nicely in this. Bottle. Pale golden beer with a good head. The aroma is citrus with some dryness, and the flavour is quite bitter with citrus, dryness and yeastiness. 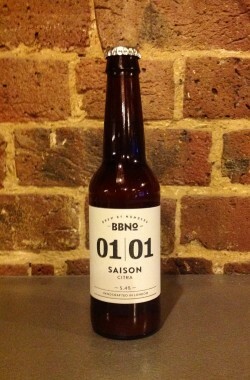 Overall a nice saison. Barwa żółta, piana średnia. Aromat cytryn, limonek, banana, ziołowe, przyprawowe. W smaku zbożowe, przyprawowe, bananowe, brzoskwiniowe, cytrusowe. Fajne pifko. From 33cl bottle at La Cantinetta, Rimini, Italy. Pours rather pale yellow with medium-high white foam, evanescent and fine. Aroma is lemon peel, spiced. Body is average with good carbonation. Taste is very moderate sweet, nice bitterness, some tanginess. Finish is short enough.